Jon Ortiz (one helluva soyale) posted the above photo to Facebook last week and we just had to know more. Because while action shots and grimy lifestyle make the blading world go ’round, Jon reminds us all that there’s more to the “big picture” than many ever consider. So we asked him to tell us more about what we were looking at. 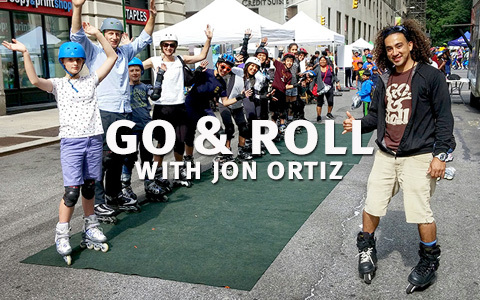 As it turns out, Jon has a private/group lesson company called Go & Roll. If the name has a familiar ring to it, that’s understandable. And by design. Jon explained to us “I obviously stole the name from Kilgore and Majette from our Denial days, with their permission…” And what a good idea. No reason to reinvent the wheel — no pun intended — when it comes to branding. As a company name for a skate lesson biz “Go & Roll” gives it to you all upfront and lays it out plain. It’s worth noting here what a good idea this is on so many levels. First, Jon is presumably earning money by doing what he loves — blading. We know a lot of us strive for that. Here’s a way to do that. Second, using an existing venue to piggyback and get in front of an audience. The NorCal guys did it or do it. Blading Cup uses a bit of that mojo too. And third, finding a way to ingratiate his services (ability to operate/earn) by “offering a service.” Not to prognosticate like a total bore, but if 100 people started doing this across the country we’d see an immediate uptick in participation. It’s not vans full of sales reps touring the country with corporate charge accounts and racks of fresh rentals, but it’s a step in the right direction. Seriously, infinite props to Jon. Oh, but it’s so simple, right? Well… “I’m accompanied in my skate booth by Noizy Brands, which is a blader-owned Bluetooth speaker company. My old school boy Jerry Chu owns it. 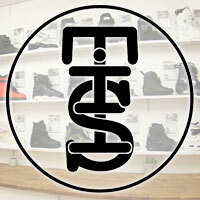 And it’s all curated and put together by Parlour Productions, which is owned by OG Ray Mendez.” Okay, okay, so it takes a village and all that. Nothing any enterprising blader can’t figure out. 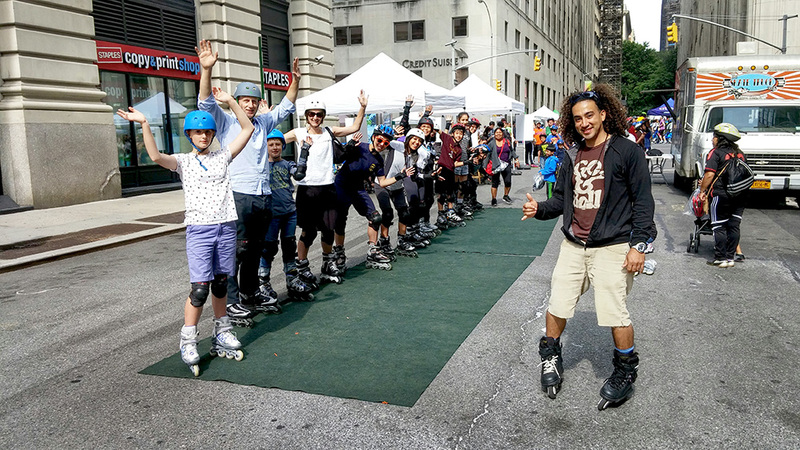 But cooperation and connections and good old-fashioned elbow grease has its rewards, like setting up a booth every weekend in NYC at 24th Street and Park Ave. that’s accessible and visible and many other criteria blading can only benefit from. And it works, as the picture shows. Jon made sure to tell us that Summer Streets is just one of the events the group sets up throughout the year. After listening to him tell it, guess we’re gonna need to check one out for ourselves. So hats off to Jon, Ray (and Jerry) and any of the Go & Roll crew that’s getting blading out there in the streets and on to people’s feet.